Gold Coast Titans are believed to be keeping tabs on Saints’ second rower Joe Greenwood, tipped as a future England international after being included in boss Wayne Bennett’s 31- man elite training squad in the build-up to the end-of-season World Cup. 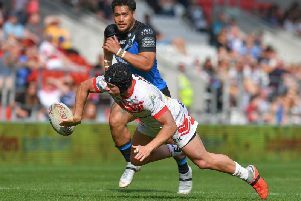 Greenwood, 23, is in the final year of his existing contract at the Totally Wicked Stadium and while boss Keiron Cunningham said this week he was unaware of the NRL club’s interest in the former Saddleworth Rangers junior, he confirmed that St Helens were already speaking to the player about a new deal. Cunningham said: “It doesn’t surprise me if the Titans are interested. Joe is an up-and-coming future England international and if I was in the NRL and had pots of money, I would be looking at all the best English talent myself. “The only thing which frustrates me in cases like this, where you’ve nurtured a kid from 12 to 13 years of age, is that there is going to be management involved. Greenwood was easily one of the best second rowers in the comp in 2015 until a broken leg curtailed his campaign, but in 2016 he got back to that form. After signing from his junior club, he trained with the first team squad in 2011 and was ‘18th’ man on a number of occasions before he finally made his debut against Oldham in the Challenge Cup in 2012. He has scored 26 tries in 76 appearances.